Productive is one of our favorite habit-tracking apps because it combines powerful features with ease-of-use in a gorgeous interface. Seriously, keeping track of your habits is a pleasure with Productive. With the free download, you can keep track of up to five habits, which can be chosen from a selection of preset habits or you can make your own custom ones. To mark a habit as done, just swipe to the right on it. Or you can "skip" it by swiping to the left. Skipping allows you to keep your streaks intact without marking the item as complete, but use it sparingly! We found Productive to be especially motivating because of the fact that successful days are green and have a line that links them up together. If you missed a day, then the chain is broken. For those of us who must have a perfect chain, this is especially motivating. Plus, the icons and colors look fantastic against the dark theme, making everything just pop. 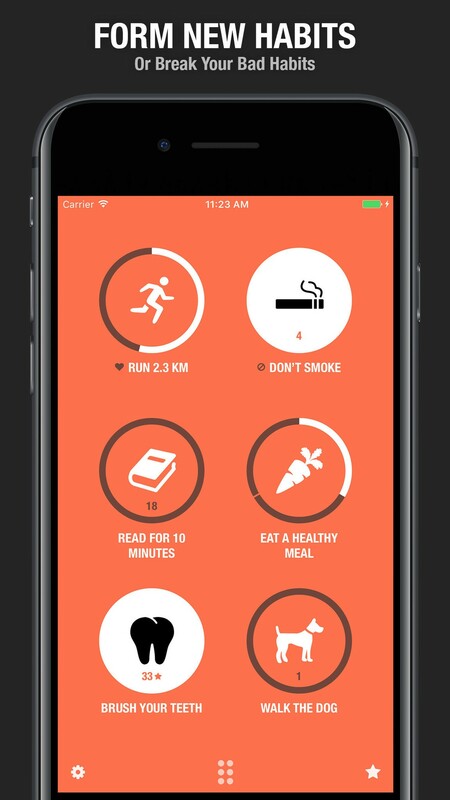 There's also a Boost feature, which allows you to select one habit to get notifications for every half hour. This is great for those habits where you really need an extra push to do. For most people, Productive's free version is enough. But for things like Boost, powerful reminders, unlimited habits, better stats, and more, you'll need to shell out for Productive Premium. This costs about $23.99 a year, but there are usually sales on the subscription rate, so look out for those. 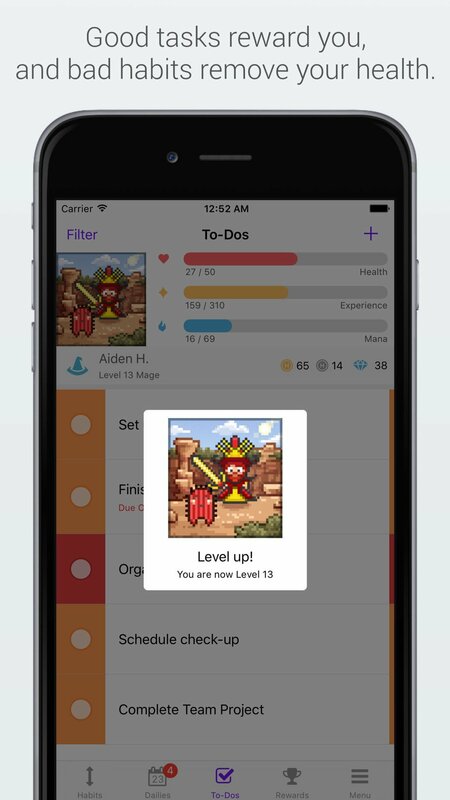 For those who need to gamify everything to make it interesting, then Habitica is the habit tracker for you. Habitica takes your habits and tasks and turns them into a classic RPG. In order to level up your character to become strong and mighty, you'll need to completing positive habits and avoiding negative ones. Users will need to create an account with Habitica in order to create their character. Every character is unique in terms of appearance and you can even pick from different classes, just like real RPGs. Then you add in your habits and tasks into one of three categories: Habits, Dailies (recurring items), and To-Dos. You're able to put Habits into Positive or Negative groups. Completing ones from the Positive side grant you experience points, gold, and mana. If you do negative habits though, you lose health or mana. In order to level up, you need to earn enough experience without depleting your health to zero. Habitica has an 8-bit style that's charming, and you can team up with other Habitica users to form guilds and parties, which entails adventures together but also support from others in maintaining your habits. A $4.99 per month subscription is available, which grants access to monthly items and premium gems, but it's completely optional and doesn't affect the overall functionality of the app. 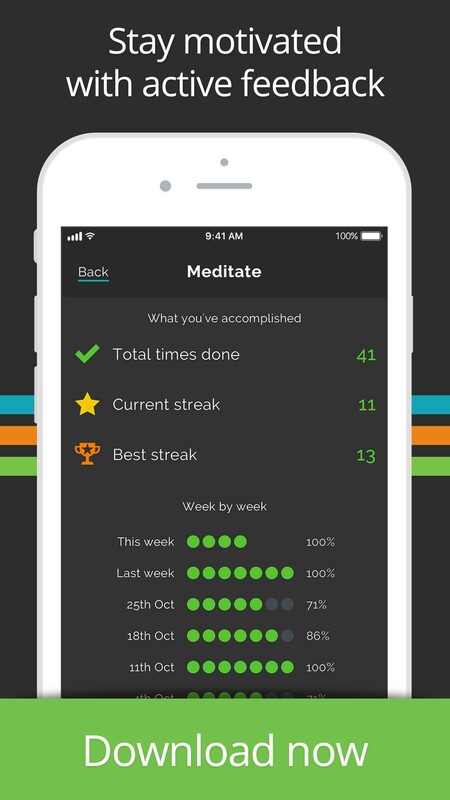 Streaks is a simple app that helps you stay on track with good habits while breaking out of your bad ones. The unique visual style of Streaks is eye-catching and it's also super intuitive. You can create habits that fit your personal lifestyle, such as quitting smoking or eating a healthy meal every day. 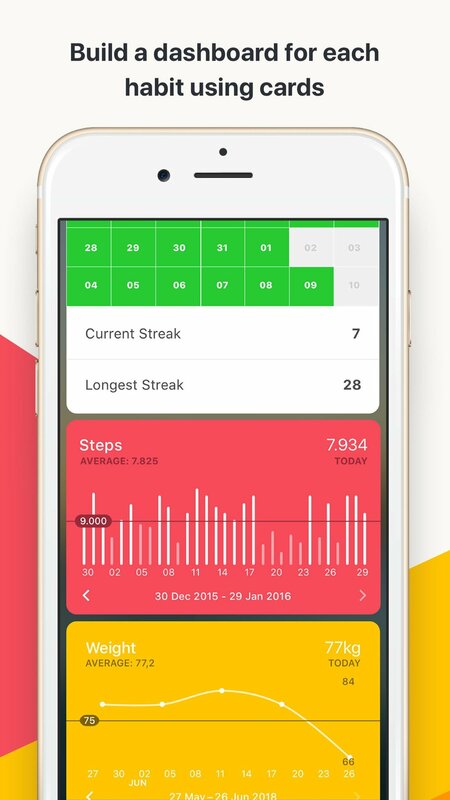 Streaks also connects to the Health app, so it can automatically fetch your data for steps, heart rate, exercise, and more. Streaks is a paid app, but you don't have to worry about any subscription plans to unlock the full potential of the app. It's one of the better options out there if you just want to pay once and be done with it. 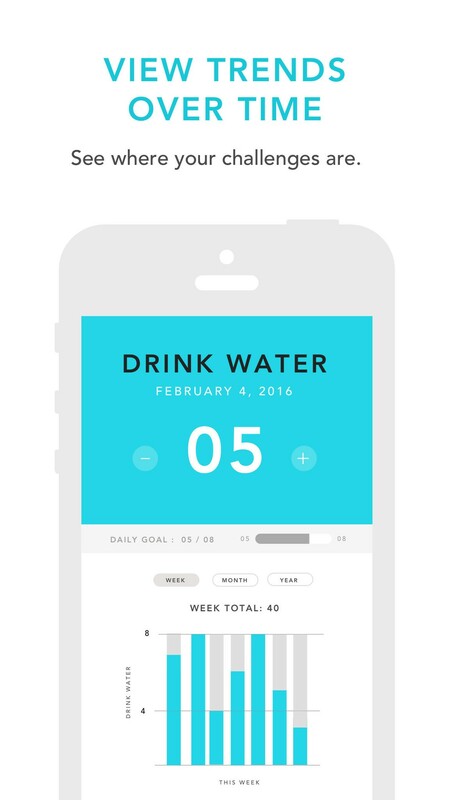 Those who want something more than just a basic habit tracker will want to look into Strides. 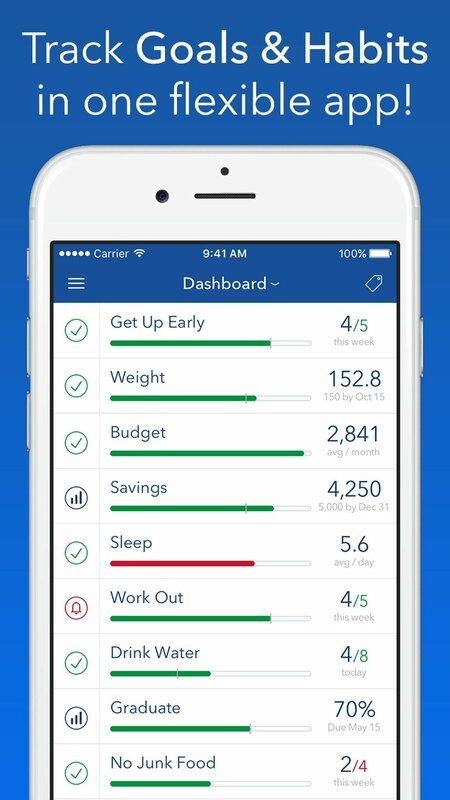 Strides differentiates itself from other habit trackers by giving you four different ways of tracking things: Habit, Target, Average, and Project. Habit is simple enough, and you just check in with a "Yes" or "No" for both good and bad habits. 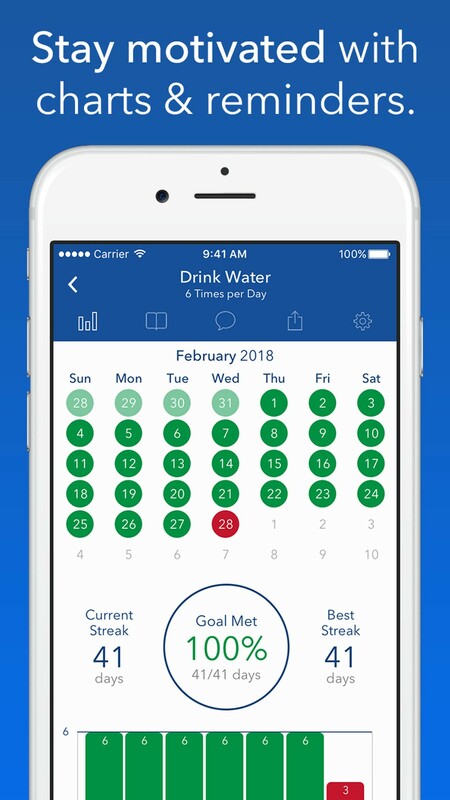 Target involves inputting goal values and then creating a pace line for you, so you can see in a single glance if you're going to meet that goal or not. 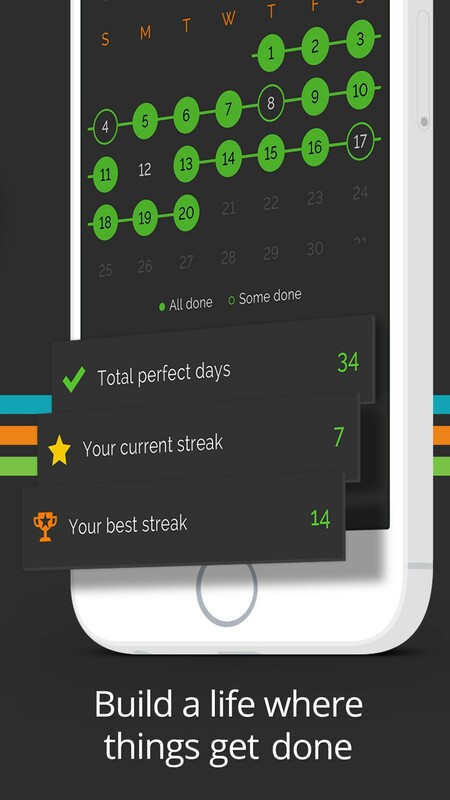 Average informs you of how long you are doing something, such as sleep. Project has milestones and percent complete sliders to help you track your progress. 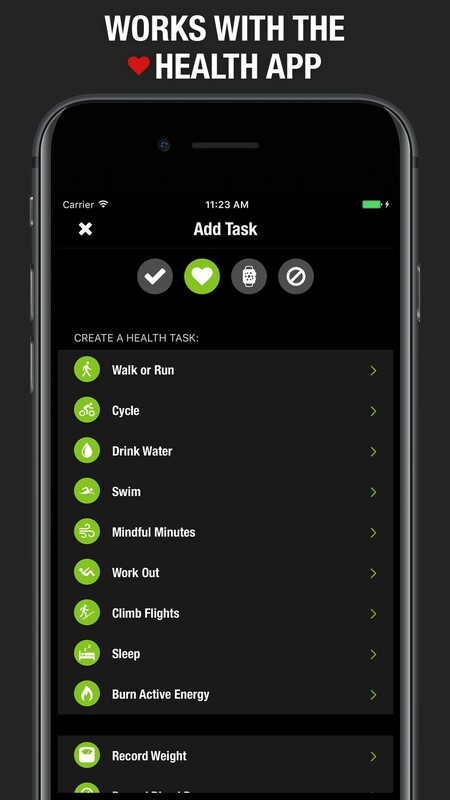 Strides is a bit more complicated than most habit trackers, but it's fairly powerful. There is also a Plus subscription, which costs $4.99 a month or $29.99 a year, and it lets you have unlimited habits, as well as access to a web version, and device syncing. When you want a habit tracker that doesn't look like another boring habit tracker, then you go with Today. With Today, you can add full-screen photo covers for each of your habits, which serve as beautiful eye candy as well as motivation. You can choose from some the ones provided in the app, or even throw in your own photographs as the cover if you want. 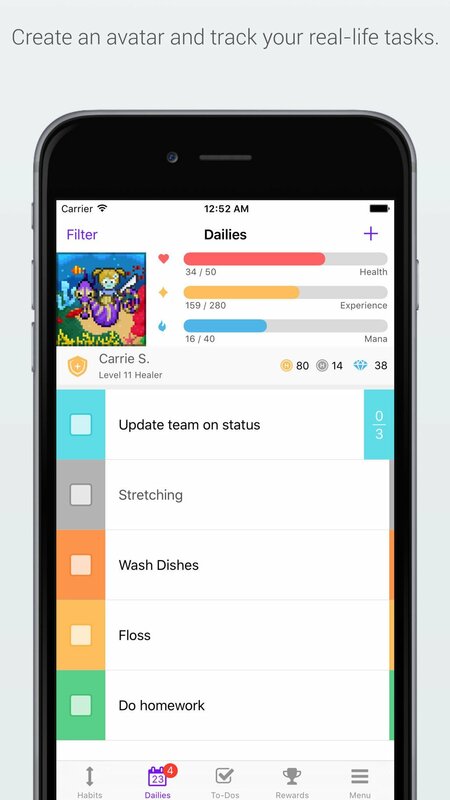 There is also the ability to create your very own dashboard of cards, which can include things like milestones, streaks, Apple Health charts, stress levels, and more. The Dashboard is very personal, and Today allows you to customize it to fit your needs. Today is free to use and gives you access to the base features, which should be enough for most. But if you want more customization and the ability to create custom reports, there is an in-app purchase for $4.99 to get all Premium features. If simplicity is the name of the game, then you'll want Done. The main feature of Done is the horizontal bar graphs it uses for progress tracking. You can create goals for both building good habits and breaking out of bad ones. 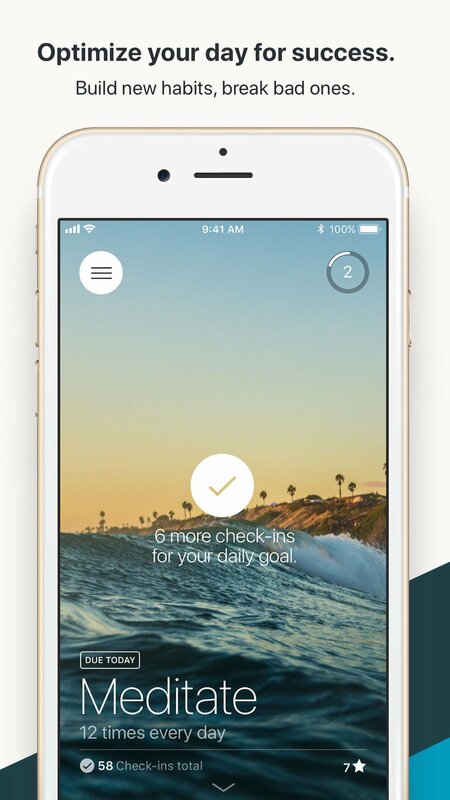 And the best part is that Done lets you set multiple goals in a single day, unlike other habit trackers that just have one goal to meet. There's also a journal feature so you can add some notes about your habit if need be. 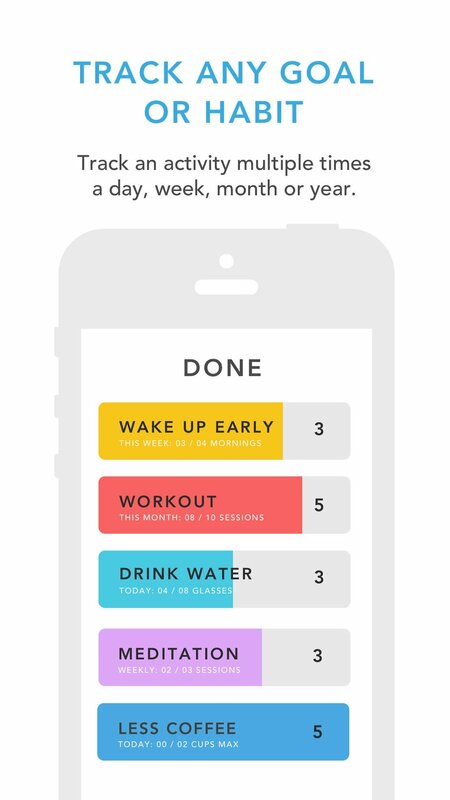 The initial free download of Done lets users add up to three habits. If you need more, you'll need to upgrade to Premium, which is a one-time purchase of $5.99. Premium also includes multiple reminders for each habit, CSV export, passcode protection, and iCloud/Dropbox data backup. It's the start of a brand new year, so there's really no better time than now to start building some positive and healthy habits while weaning off the negative. I know I always say "This is going to be my year!," but I eventually lose track because I end up falling behind. With these apps, hopefully, I'll follow through better. What are you using to keep track of your habits and goals for the new year? Sound off with your favorites in the comments below!